Who says everyday lunch has to be ordinary? For a flavorful and decadent meal, look no further than this Caprese Prosciutto Sandwich with Fresh Basil Aioli. The slight sweetness of the egg twist roll pairs seamlessly with the savory Prosciutto di Parma, roasted eggplant and smoked mozzarella, which excites the palate. Pair with a refreshing pitcher of lemonade (or your favorite light beer, we won’t tell). 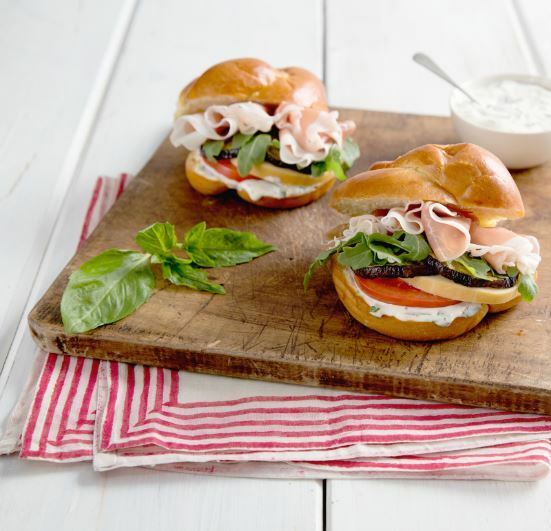 This prosciutto sandwich is sure to be a hit with adults and kids alike for every event from outdoor summer barbecues to a simple weekend family meal. On a baking sheet, arrange eggplant slices in a single layer. Brush both sides of with olive oil and roast until browned and cooked through, about 20 minutes. In a small bowl, combine mayonnaise, basil, lemon juice, garlic and pepper. Set aside. To assemble sandwiches, spread about a tablespoon of the aioli on cut sides of each roll. Top each with tomato, mozzarella, eggplant slices, arugula and prosciutto, distributing ingredients evenly. Top with remaining aioli, dividing evenly between sandwiches. Top with remaining roll halves.